Yesterday Microsoft launched the Federated Search Connector Gallery and they started it out with a decent list of connectors. 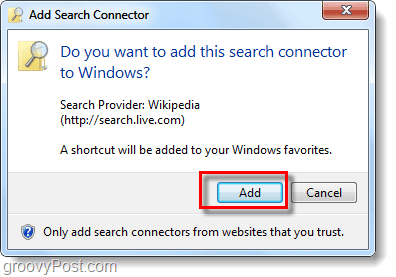 Although Microsoft is targeting the enterprise with their Enterprise Search connectors, anyone with Windows 7 can use them to embed the search connectors into Windows Explorer for 1 stop searching! What is a Search Connector? Federated Search Connectors allow a search solution based on any Microsoft Enterprise Search product (Microsoft Search Server 2010, Microsoft SharePoint Server 2010, Microsoft FAST Search for SharePoint 2010, Microsoft Search Server 2008, or Microsoft Office SharePoint Server 2007) to pass a query to a target system and accept and display results from that system. This connector returns results from Wikipedia. See the Federated Search Connector Gallery for other connectors and instructions for using connectors with specific Microsoft Enterprise Search products. The download site doesn’t list any as compatible with Windows 7 or Vista, however the .OSDX version works just fine. To install the search connector all you have to do is Download it and then open the .osdx file. A window should appear, Click Add and you are done! Easy eh? All you have to do to use the search connector is open up Explorer and Click it under your favorites list. Once you are on the connectors page your search box becomes the connector search tool. In the example below I used the Wikipedia search connector to pull up web results from the Wikipedia.com website. 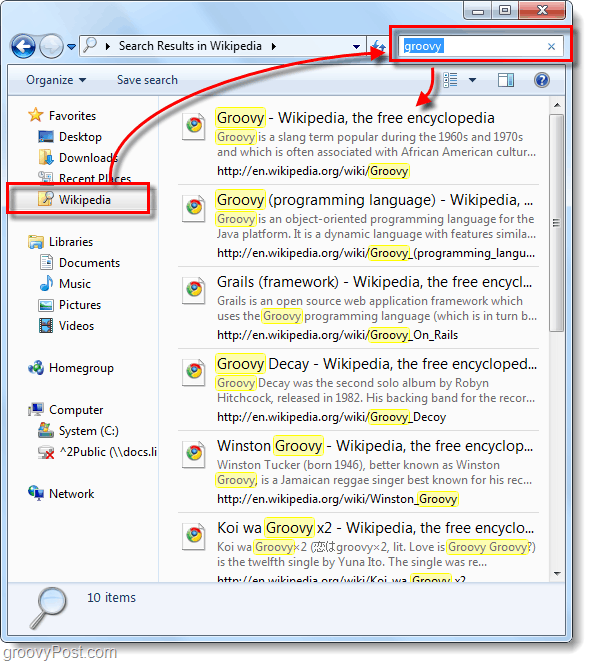 Do any of you groovy readers use search connectors? We’d love to hear your experience with them in the comments below! If you have a groovy tip you want to share, drop us a note at tips@groovypost.com!